how pure is bottled pure spring water? “........only five pounds yuh send? laws improvising an’ english q-cees hustling..
Yuh fooling, Brotherman, yuh fooling. You ent see all we getting is pool table? Give your children schooling or else, Brotherman, we fooling. Go charge a Home Affairs minister? Is we alone joking, Brotherman, we joking. You fooling, Brotherman, you fooling. So we getting pressure from every crowd. Chilling - like cold reality always is when it is dumped on your head. This was sung in 1977 and if we are concluding as you listen that it is still relevant, then Maestro's genius is timeless and we wuk now start. Wise listeners will make this calypso less about cataloguing wrongs and more about encouraging positive traits like self-esteem, self-reliance, self-determination, social and political awareness, community cooperation, vigilance, prudence, parental responsibility, land ownership and living within our means. Don’t be appalled, some damage is collateral. Lord, I ‘fraid I end up as, collateral damage in Port of Spain. Seem to me, somebody have full immunity. I afraid, I real afraid! Hear dis one! Listen Chief, dat sounding like, “All ah we tief.” You ent find? The average citizen ent feeling no pain. Not at all! You hear that! Imagine I get shoot and they just dismiss me as collateral damage! What a thing! Take a stroll, once you sure you ent owing Dole. But now I ‘fraid I end up as, collateral damage in Port of Spain. But I still love the old time days. What was mine was yours too. Then I going back, I going back. Yeah, yeah. Uhmmm... Bring it back, bring it back. Thank you, Nappy Mayers! I feel the same way. It was the Graf Zeppelin which had come to pay a visit to Trinidad. They were waving little flags which they had heralding their visit to Trinidad. Was the Graf Zeppelin which had come to pay a visit to Trinidad. "Massa, can you tell am what is that thing? He have nothing hold him up dey and still he never fall." 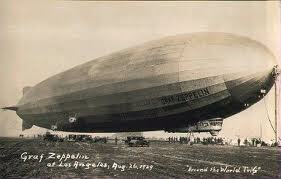 He was speaking of the Zeppelin that had come to pay a visit to Trinidad. I chanced to hear a big, fat woman said, "Me dear! Not for a million dollars I wouldn't go up in the air! But I think that the ground good enough for me." Be an exploiter like Columbus, oh baby. Then to the Niagara water fall, oh baby. And Columbus who discovered America, oh baby. Like Don Antonio de Berrio, oh baby. Then see the Nawab of Singapore, oh babe. See my grandparents in Africa, oh babe. The old man Christopher Columbus, oh babe. Be an exploiter like Columbus, oh babe. "Even like Lord Nelson, I’d like to be, I mean the ruler of the air, the land and the sea, To acquire power wherever I go, Like Don Antonio de Berrio, so darling," "Then I’ll be famous like Wellington, Or our first Governor, the great Chacon, I mean the Himalayan mountains, I’ll even score, Then see the Nawab of Singapore, so baby," "Then every school child will be taught the name Selewa, who acquired unrivalled fame Even bolder and more courageous Than the old man Christopher Columbus, so darling,"
Just beautiful, King Selewa! I love hearing your interpretations. Because you approach this music as someone from outside of our way of seeing and hearing, you allow us to uncover additional facets. and bawl: "Ay, Spoiler, boy! When you come back?" and if they still can talk, I answer: "Hell." and Satan send me to check out this town. to sing what I did always sing: the truth. is only big fat women I going to bite. of what passing over this caribbean. To come back as an insect or animal. "area of darkness" with V. S. Nightfall. your own presumptuous image in their eyes. and black still poor, though black is beautiful. daily, that our deliverers may sleep. all you go bawl out, "Spoils, things ain't so bad." smile at their brothers, "Boy, is just the whip,"
I free and easy, you see me have chain? what sweet in goat-mouth sour in his behind. what right in Guyana, right in Uganda. the audience have more talent than the show. we-self on our own self-sufficient state. what happen to the Brotherhood of Man? my chorus is the same: "I want to fall." Oh, wheel of industry, check out your cogs! "area of darkness," with V. S. Nightfall? "Things ain't go change, they ain't go change at all,"
to my old chorus: "Lord, I want to bawl." The poor still poor, whatever arse they catch. and who does sew and sow the patch the land? The Indian. And whose villages turn sand? of the torn foam from Point to La Fillette. all of them wave to Spoiler on their way. fatique, and groaned "O God, I feel to fall!" salted my songs, and gave me their high sign. you pass him straight, so now he gone back down. Tell me, where did they go? Peace and harmony. Oh, somebody hear me. Why de misery? Tell me, tell me. Somebody tell me. Oh, come together now! One day of prayer! It means that yuh on yuh own. Twenty five years have gone, how yuh feel? Yuh feel yuh put yuh shoulders to the wheel? Yuh feel yuh perspire and achieve? Yuh feel yuh clean up the mess? Yuh feel yuh could stand up proud and say yuh feel that yuh did yuh best? Yuh feel that we just keep moving on or backing back on we heel? It means what yuh sow you shall reap. Yuh feel is joke we joking or for real? Yuh feel we work hard and we produce? Yuh feel that things going fine? Yuh feel we reaping the benefits? Or yuh feel we on the decline? Yuh feel exporting was really good and we make the proper deal? For a chain is as strong as its weakest link. Yuh feel we have things covered and well seal? Yuh feel that them leaders pave the way? Yuh feel that we produce champs? Yuh feel that honesty was a must? Or yuh feel was a set ah scamps? Yuh feel that things looking shaky to fall? Or we standing solid like steel? For a fool and his money will soon part. Yuh feel the facts was reveal or concealed? Yuh feel financially things was good? Yuh feel money was well spent? Yuh feel the people responsible could account for every cent? Yuh feel that justice was really done? Or yuh feel you could appeal? That we didn't get Independence before. We bound to be a success. Tell the world there’s a model nation at last. Our Nation ent second to anyone. And we bound to be a success. Thanks for a good job and well done. hang until dead this system of neo-colonialism . The people who won't are cowed. The people who are fools don't think twice. The people who act are too slow. And our demons are starting to glow. And does not come to see and know his people! Forever blotted out and made extinct? If so by whom or what! Repugnant thought! For pent-up feelings long and hard repressed! Back to the sea from whence they came unbidden. Till I have overcome or died in the attempt. And the right things they would never say. So you see friends, this is a real King Solomon's mine. Is really too much for me to bear. For our policy stands for racial equality. And if I can't come, I go send my wife. In this great island in the sun. Friends, we cater for one and all. And if you think all this is a lie, the Mighty Sniper go tell you why. And as you know Carnival is the greatest frolic on earth.